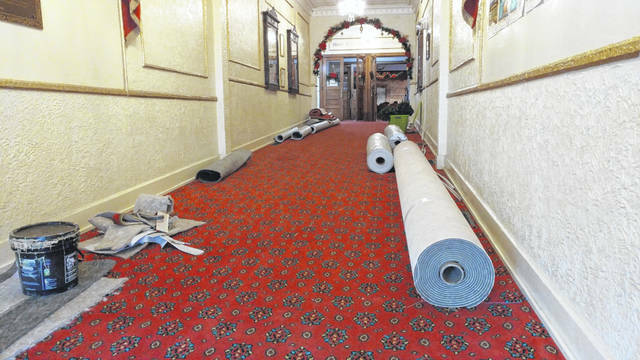 The Ariel Opera House has been working to replace key characteristics of its original aesthetics and recently placed new carpet in its halls to welcome visitors, carpet that is close to the original design placed in the location’s halls decades before. GALLIPOLIS — To cap off the end of The Ohio Valley Symphony’s season, Peter Stafford Wilson will conduct the rousing April 27 Spring Strings concert. Soloist Tim Berens encouraged his friend, Grammy-nominated American composer Frank Proto, to premiere his newly written double bass concerto in the Ariel Opera House. Proto was in agreement and decided to include Berens on guitar. The first half of the concert will feature Proto’s music and the second half will feature Beren’s arrangements. Now in his 17th season as music director of Ohio’s Springfield Symphony Orchestra, Proto concurrently holds the post as music director of the Westerville Symphony. He also fulfills his seventh season as Principal Conductor of Tulsa Ballet, leading three productions, including the annual holiday performances of Tchaikovsky’s The Nutcracker, with choreography by Artistic Director Marcello Angelini. The Springfield Symphony Orchestra’s 2005 Agriculture and the Arts Growing Together brought international attention to the organization, as did the sequel, American Made: Celebrating Our Manufacturing Heritage which premiered in November 2007. The orchestra’s innovative series, Night Lights has enjoyed steadily increasing sales and attendance. The recent endowment of the Music Director chair with gifts totaling $1 million dollars is further testimony to the community’s expanding support. Wilson and the SSO are the recipients of a 2009-10 ASCAP Award for Adventurous Programming. From 1990 to 2008, Wilson held the posts of assistant and associate conductor of The Columbus Symphony Orchestra. In Columbus, his duties included the leadership of the orchestra’s nationally recognized educational projects, which have been featured at national conferences of the American Symphony Orchestra League and Music Educators National Conference. He led programs on all of the orchestra’s classical and Pops subscription series, and played a major role in its 1997 Viva Vienna Festival. Subsequently, he was named artistic director of the orchestra’s Festival Weeks @ The Southern, for which his innovative programming was consistently praised. He is the recipient of a 2010 Columbus Symphony Orchestra Music Education Award, given in recognition of his 20 years of dedication to the orchestra’s educational programming, as well as a 2017 Columbus City Schools’ Outstanding Leadership Award and a Greater Columbus Arts Council Community Arts Partnership Educator Award. Berens’ multi-faceted career gives testament to his lifelong quest to learn, perform and write music. So far, his venture has led him through the worlds of classical guitar, jazz guitar, orchestral guitar, arranging, orchestration, composition, and conducting. During his years as the guitarist for the Cincinnati Pops Orchestra, Berens played guitar, banjo, mandolin and bouzouki on concerts, recordings, television programs, and tours. Beginning in the late 1990’s, Berens began arranging for the CPO, eventually becoming the orchestra’s principal arranger. Proto was born in Brooklyn, N.Y. He began piano studies at the age of seven and the double bass at the age of 16 while a student at the High School of Performing Arts in New York City. After graduating he attended the Manhattan School of Music where he earned his bachelor’s and master’s degrees. As a student of David Walter Frank performed the first solo double bass recital in the history of the school. As a composer he his self-taught. During the early 1960s he earned his living as a free-lance bassist in New York City, performing with such organizations as the Symphony of the Air, American Symphony, the Robert Shaw Chorale, and — as one of the original members — the Princeton Chamber Orchestra. He also played with various Broadway and Off-Broadway show bands and in many of the jazz clubs that were a mainstay of New York nightlife at the time. In 1966 he joined the Cincinnati Symphony Orchestra where, with the help and encouragement of CSO Music Directors Max Rudolf and Thomas Schippers, he began to bloom as a composer. The early opportunities given him by the CSO to compose and arrange for the orchestra resulted in a 30 year stay in which the orchestra premiered over 20 large works and countless smaller pieces and arrangements composed for Young People’s concerts, Pop’s concerts, tours and special occasions. Proto was appointed Composer-in-Residence by Thomas Schippers in 1972 and during his tenure with the orchestra every music director commissioned him to compose works to feature various principal players, visiting guest soloists or the orchestra itself on its subscription concerts, including Max Rudolf Concerto No. 1 for Double Bass and Orchestra; Thomas Schippers Concerto in One Movement for Violin, Double Bass and Orchestra and Concerto for Cello and Orchestra; Michael Gielen Dialogue for Synclavier and Orchestra; Jesus Lopes-Cobos The New Seasons for Tuba, Percussion and Orchestra, Hamabe No Arashi and the Music Drama Ghost In Machine. Writing for the Pops, his Casey at the Bat has been performed over 500 times and has been recorded twice, while his Carmen Fantasy for Trumpet and Orchestra — commissioned and recorded by Doc Severinsen — recently received its 400th performance. His Fantasy on the Saints, An American Overture and Variations on Dixie have become standards in the Orchestral Pops repertoire. Information provided by the Ariel Opera House.